Everyone can always use a little extra luck, right? Well, here’s a fun tabletop decoration perfect for a Saint Patrick’s Day party, or as a cute gift for someone who just hit the jackpot. I used a hot engraving tool to add detailing to each letter, reminiscent of Celtic knots, and then outlined the word with a black paint pen to make everything pop. And although a four-leaf clover is the traditional symbol for good luck, I decided to add a little luck of the Irish with a three leaf shamrock instead. Hmm – I might just try my luck tomorrow and buy a lotto ticket! 1. 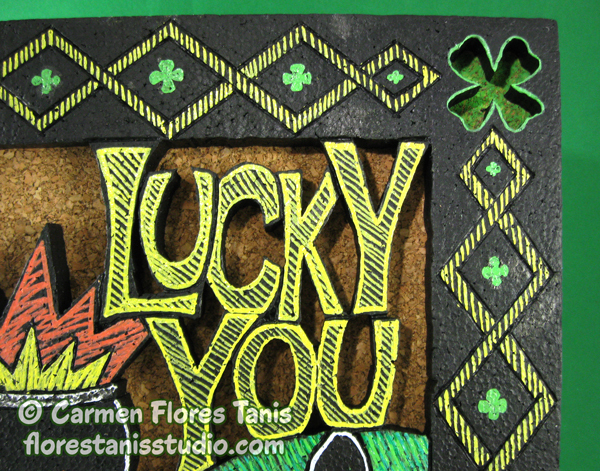 Click here to download my “Lucky Shamrock” artwork* and print it onto the Sulky transfer sheet. Because it is too long to fit onto one sheet, it’s tiled into two sections. Cut the sheet in half between the two lines of text. Peel off the backing paper and press the two pieces together to fit on the Smoothfoam block. Trim off the excess transfer sheet. Poke pilot holes with the hot knife into each area of the block that will be cut out. 2. Carefully carve out the Smoothfoam block with the tabletop hot wire cutter. Unthread and re-insert the wire into each pilot hole to make each interior cut. 3. Add details to the carving with the engraving tool as shown. Peel off the transfer sheet when finished. 4. Paint the carving gold. Let dry. 5. Paint the shamrock green. 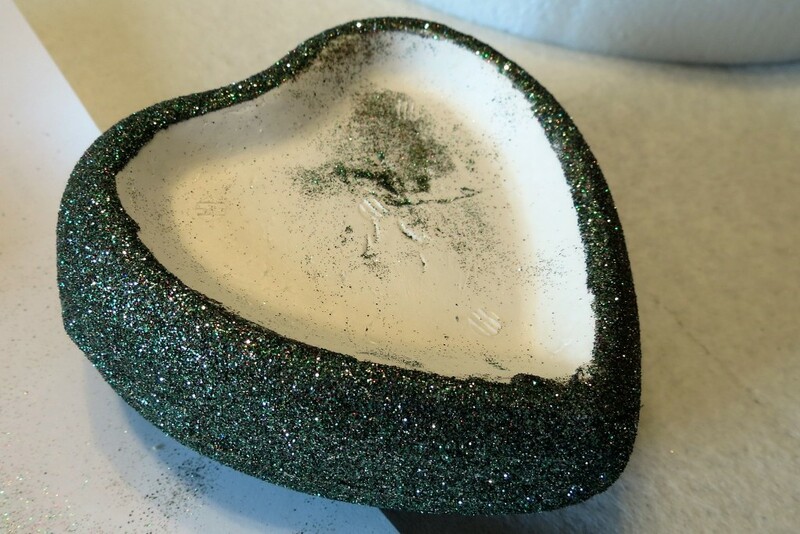 While the paint is still wet, sprinkle with dark green glitter. 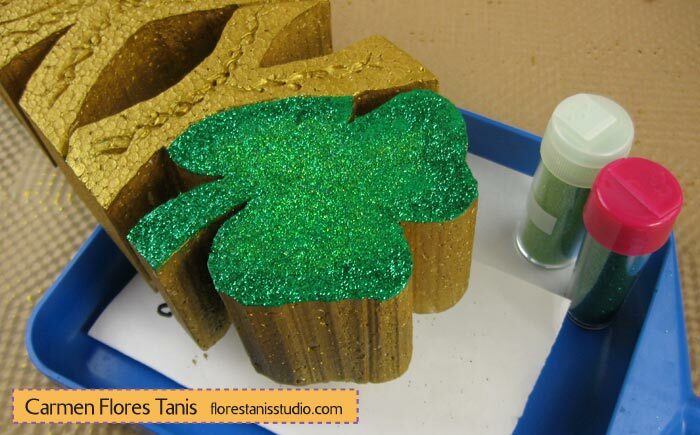 Add a little more green paint to the center of the shamrock and sprinkle with light green glitter. Tap the carving to remove any excess glitter. Let dry. 6. Outline the carved letters with black paint pen. * You are welcome to use my original artwork for your own use or for a gift/donation only. You may not use my designs for items intended for resale – that is a copyright infringement. Thank you! 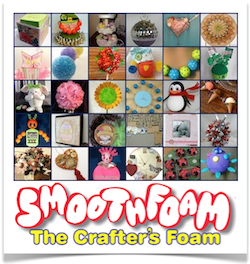 Cut Smoothfoam sheet to desired size. If necessary, smooth rough edges with sand paper. 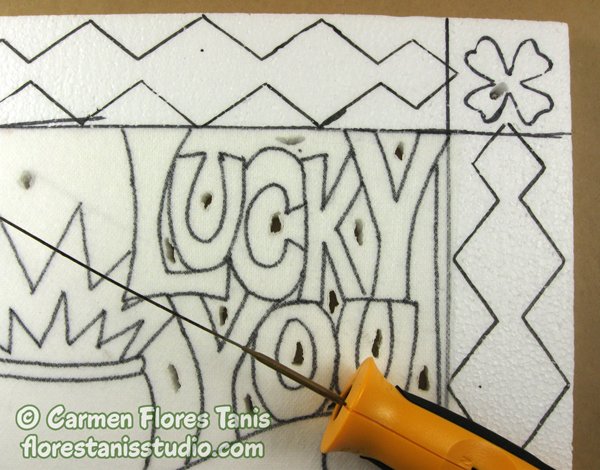 Press the rubber stamp’s pattern into the sheet (if needed, a hammer helps with this process). Use edge of stamp to distress edges/corners. 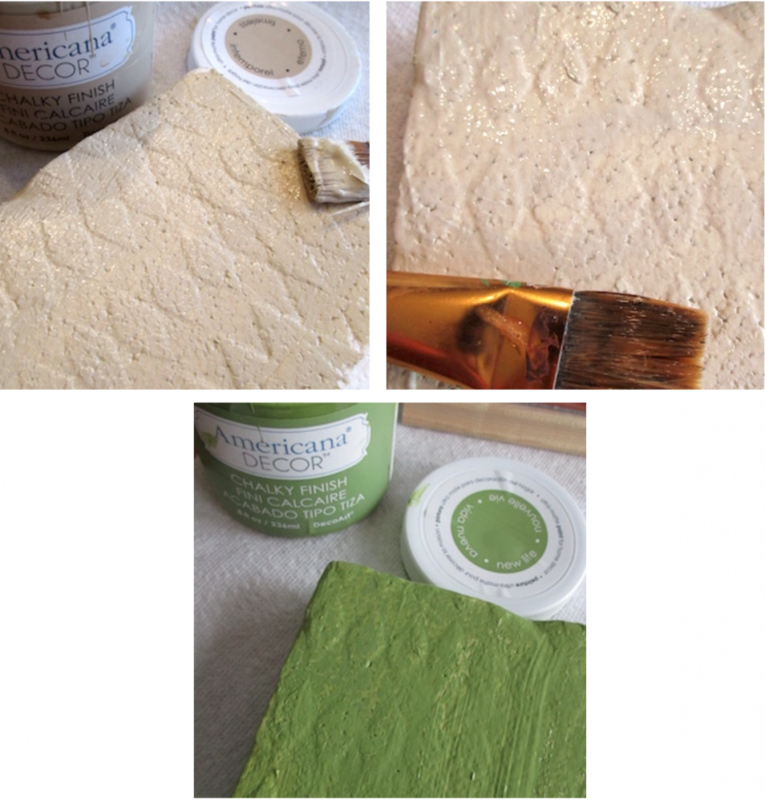 Paint the embossed sheet with Timeless (tan) chalky finish paint and let dry. Apply crackle medium and let dry. Then paint with New Life (green) chalky finish paint. 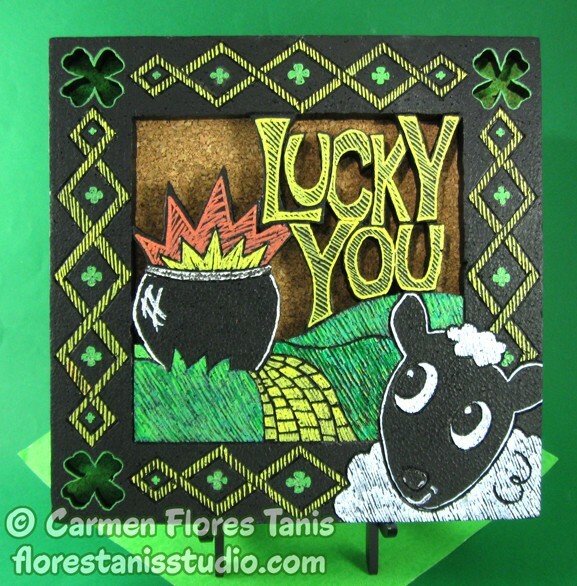 Resize the St. Patrick’s Day graphic to desired size (5” x 7” on mine). Reverse the image before printing onto Craft Attitude film. Mount the film to the center of the painted sheet using clear-drying glue stick. 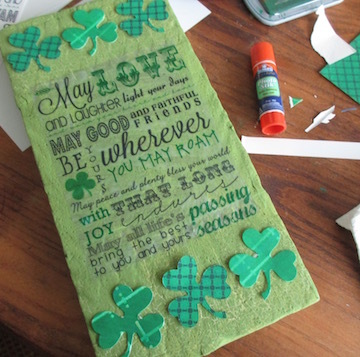 Use color sponge and Evergreen ink to alter the color of a sheet of patterned paper, then die-cut 6 shamrocks from it. 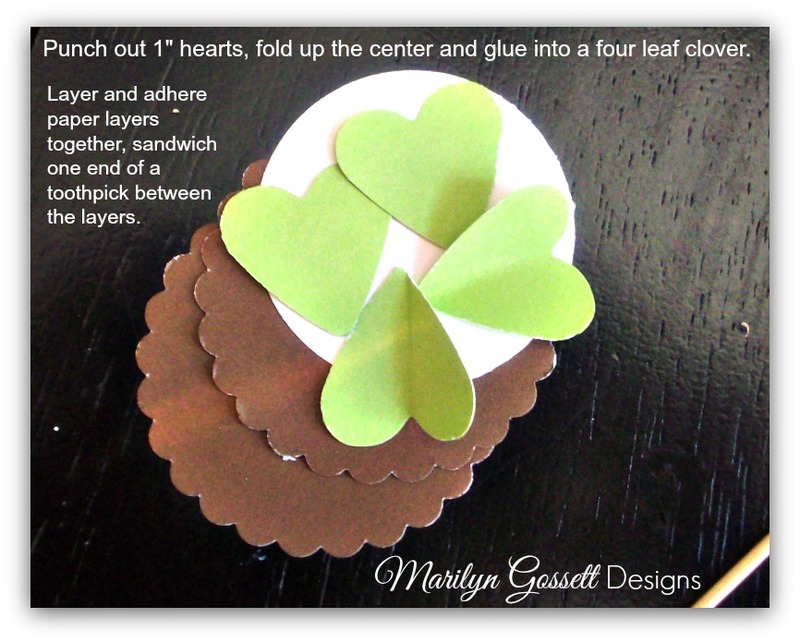 Arrange and glue shamrocks above and below text. 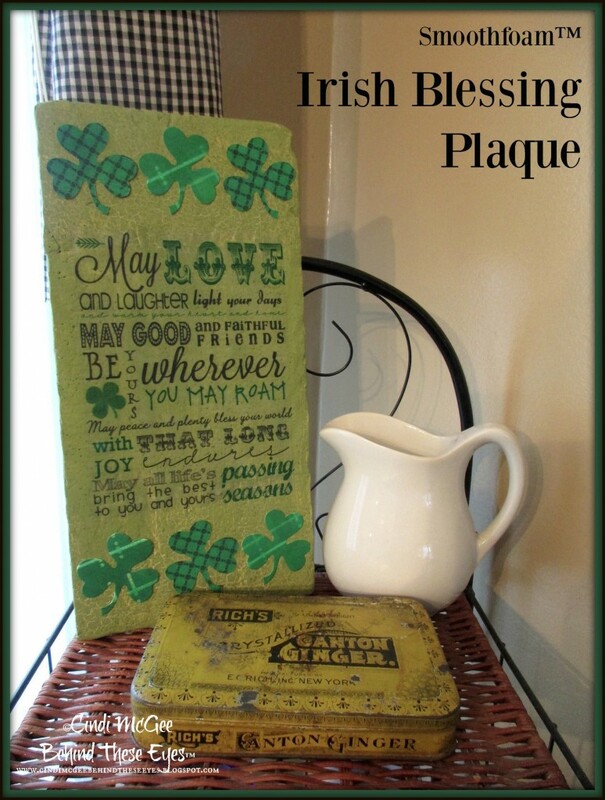 Be sure to browse our blog for other St. Patrick’s Day crafts. Don’t have the luck of the Irish? 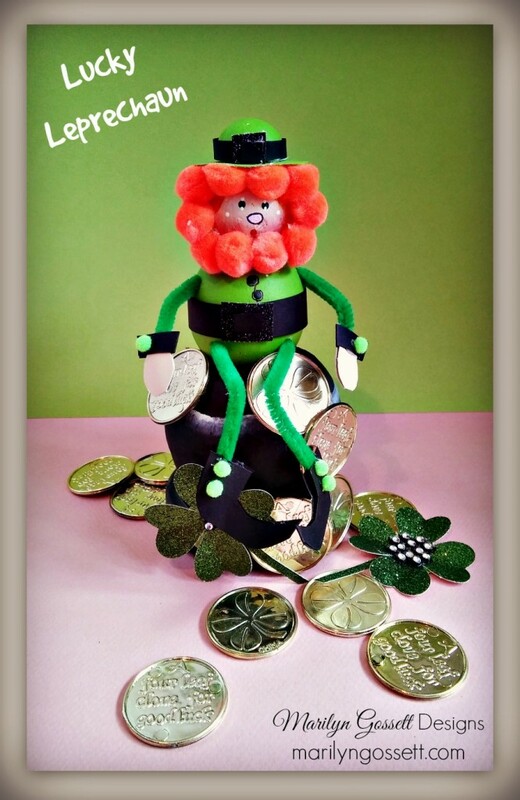 You might just need this little lucky leprechaun craft to cheer up a corner & to help celebrate St. Patty’s Day! 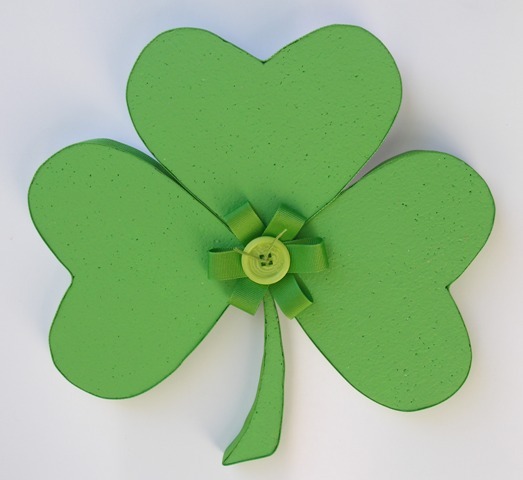 Browse our blog for other St. Patrick’s crafts. 1. Cut the rounded top off of the top of the 3″ ball. 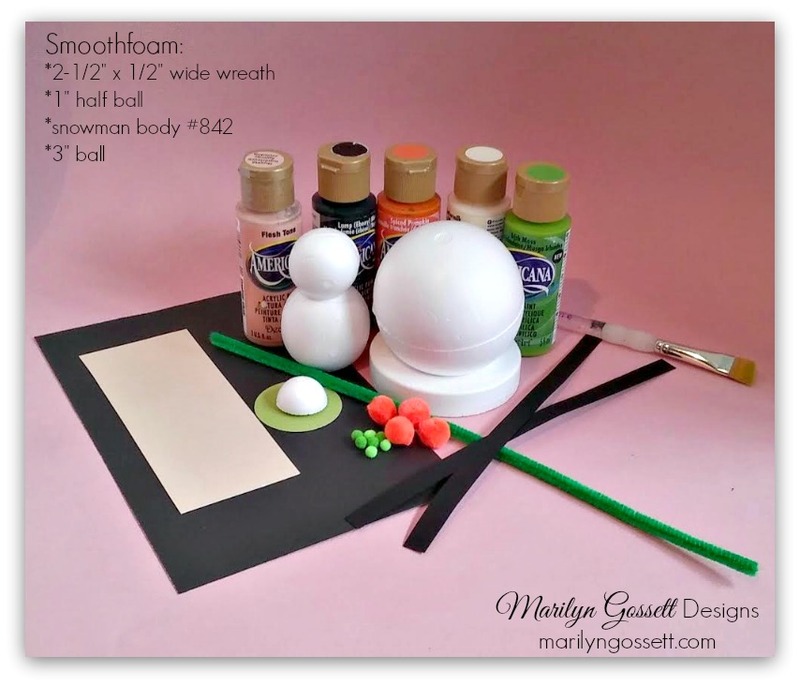 Use the wood skewer as a handle and paint the Smoothfoam pieces as follows: snowman head – peach; snowman body – green; wreath (pot base) and 3″ ball (pot) – black; 1″ half ball (top of hat) – green. Let dry. Apply a second coat and let dry thoroughly. 2. To make the hat – punch or cut a 2″ circle from the green cardstock. Adhere the 1″ half ball to the center of the circle. Cut a 1/8″ strip from the black cardstock to fit around the crown of the hat. Slightly overlap and glue the ends to secure. Cut a tiny square for the buckle on the hat band. 3. For the leprechaun – blush the cheeks using powder blush. Glue the orange pom-poms to the face as shown. Adhere the hat to the top of the head. apply a dip dot in black for each eye. Apply a larger dot for the nose and a dot for the mouth. To make his belt, cut a 3/8″ wide strip of black cardstock to fit around the middle. Overlap and glue the ends to finish. Cut a tiny square for the belt buckle and adhere. 4. Poke the pilot holes for the arms and legs a skewer. Cut the green chenille pipecleaner into 4 parts, with the leg pieces slightly longer than the arms. Glue into the pilot holes as shown. 5. 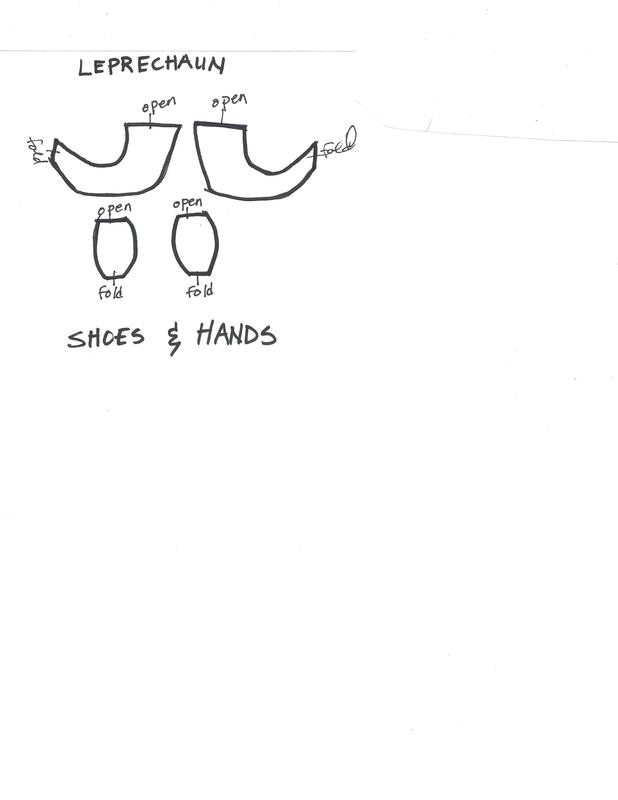 For the hands and shoes, click here to download, print, trace and cut two hands and two shoes on folded cardstock. Glue the end of the pipecleaners between the layers of the hands and shoes. The fold should be pointing out. 6. Cut black cardstock cuffs for the arms. Wrap and glue above each hand and finish with a tiny pompom cuff link. Apply the remaining 1/8″ pompoms to the sides of the shoes. 7. Adhere the 3″ ball (pot) into the 2-1/2″ wreath (base). Glue the leprechaun to the top. Bend his legs and arms in desired position. 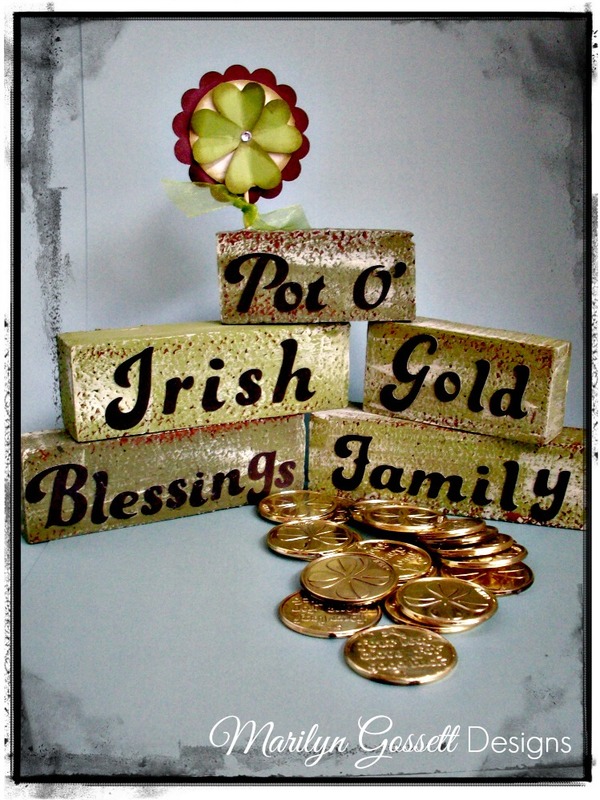 Glue the gold coins to the pot and leave a few extra to place on the table around the base of the pot. Need a little tabletop decoration to celebrate St. Patrick’s Day? 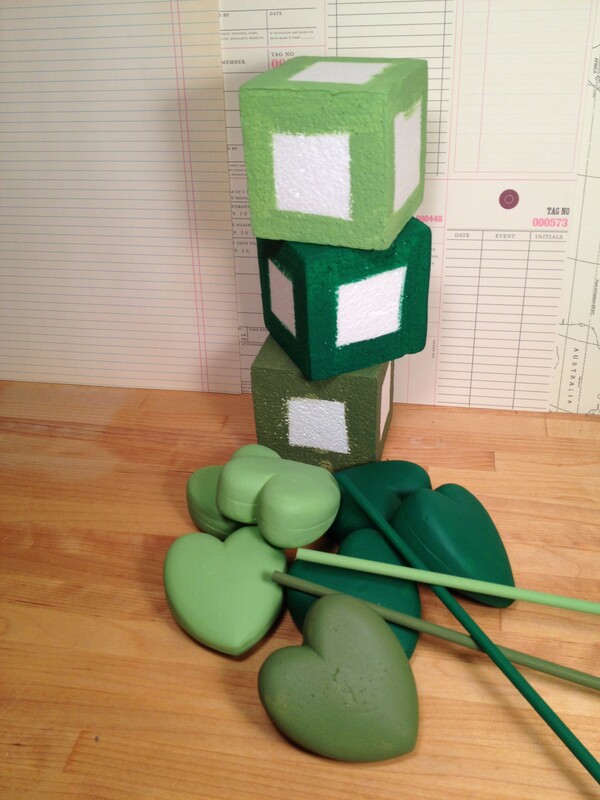 These little lightweight blocks add a spot of color and Irish cheer to any space! 1. 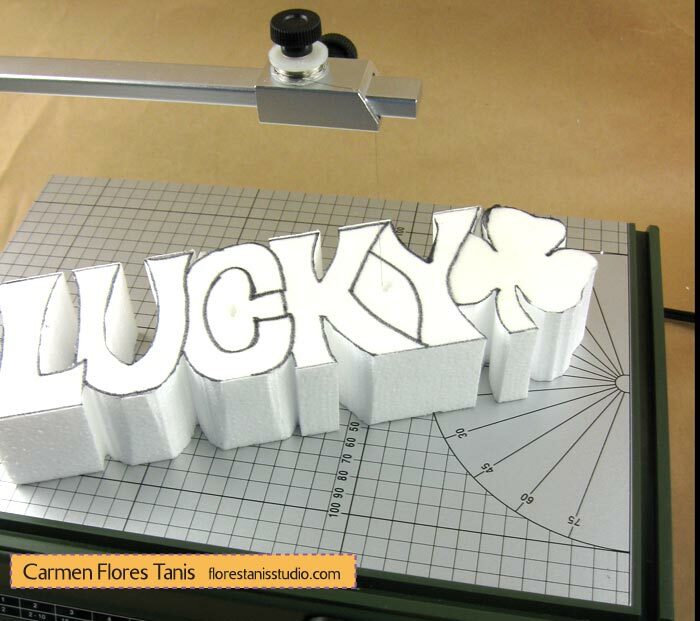 Measure and mark the Smoothfoam sheet to cut into blocks for each word. The hot wire tool works best if you cut on the line using the straight edge of the ruler to get a straight cut in the foam. 2. Paint each block brown and allow to dry. Paint a second coat of green; allow to dry. Finish by dry-brushing very light amounts of cream paint over the green. 3. 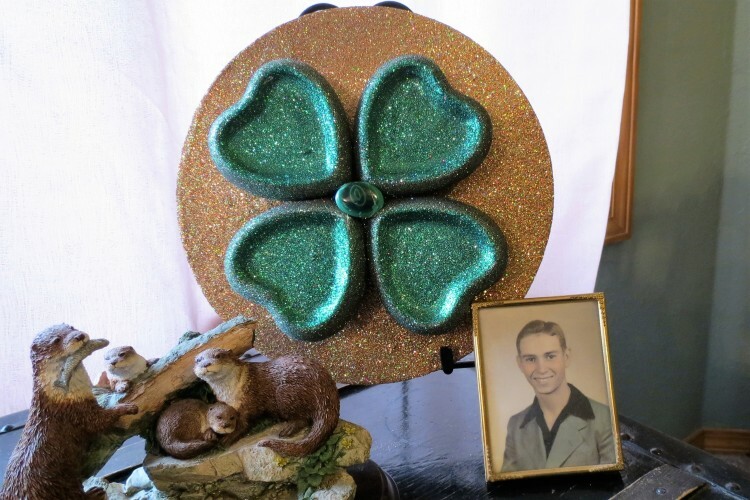 To make a shamrock topper, punch or die-cut a brown2-1/4″ scallop circle, one cream 1-3/4″ circle, and four green 1″ hearts. Fold each heart down the middle and apply chalk ink to all edges. Adhere the layers together as shown, forming a shamrock with the hearts. 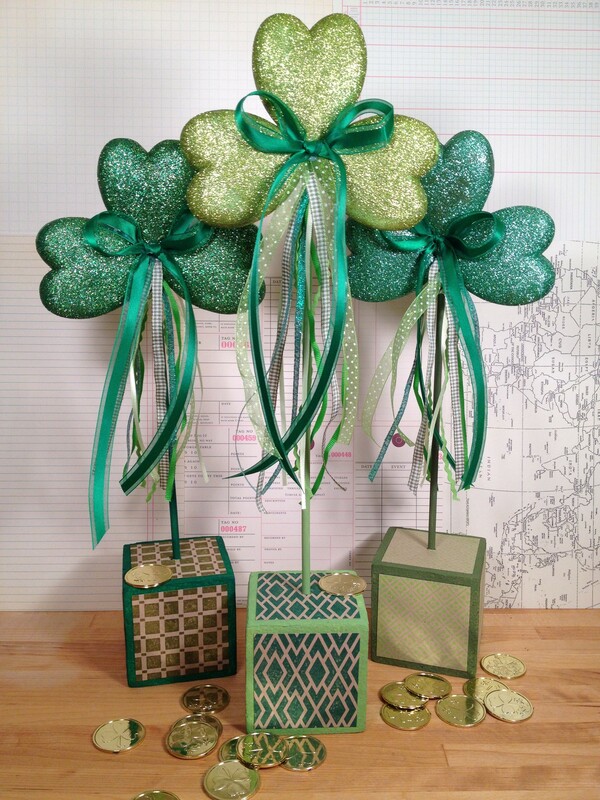 Glue a clear rhinestone in the center of the shamrock, glue a skewer to the back and tie a green ribbon in a bow around the skewer. 4. Glue words to the blocks as shown. I put “Family” on one side of a block with “Friends” on the other side. Poke the end of the skewered shamrock topper in the top block as shown. Feeling a little Irish? 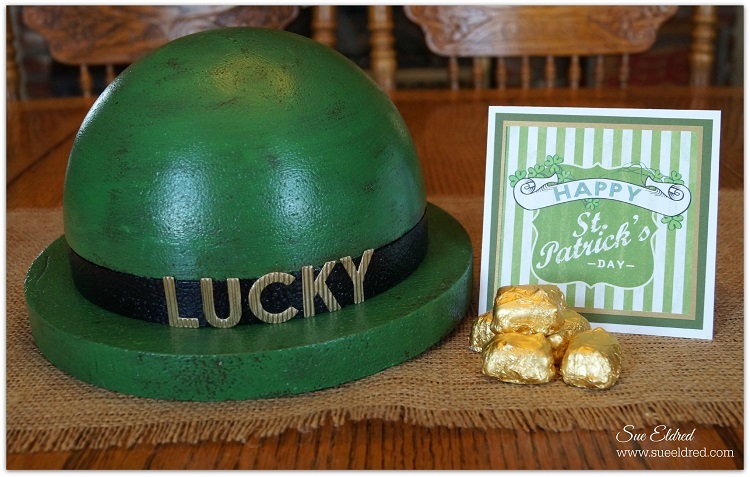 Need a Lucky Hat for St. Patty’s Day? 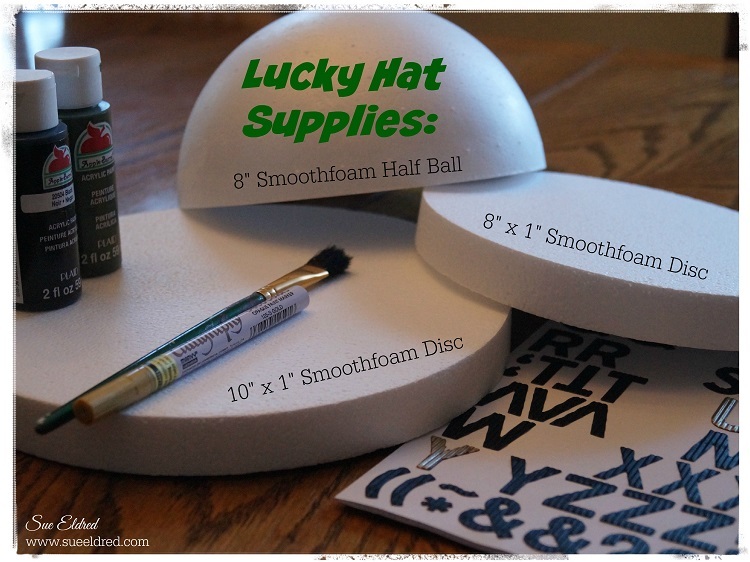 Using only a few Smoothfoam shapes, you can make yourself a Lucky Leprechaun Hat centerpiece in no time. It’s a fun and festive addition to all your green celebrations! 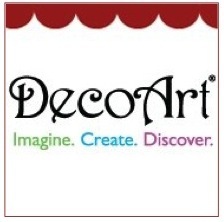 Paint the 8″ half-ball and 10″ Disc with English Ivy and let dry. Add a second lighter coat of Kelly Green paint, allowing some of the darker green to show through. Paint the sides of 8″ disc black and let dry. Glue the 8″ disc flush to the bottom of the painted half-ball, then center and glue that on top of the 10″ disc. Let dry. 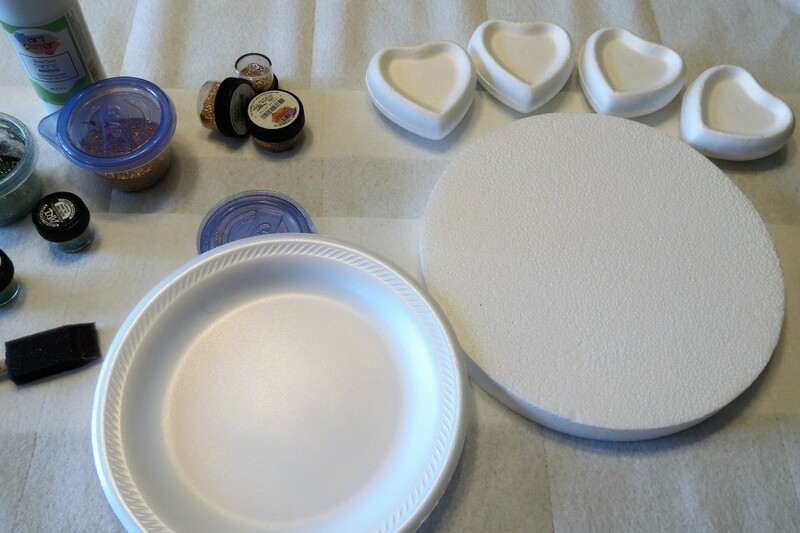 For a glossy finish, paint the entire hat with Mod Podge and let dry. Paint the chipboard letters with the gold paint pen, let dry, then glue to the black hat band. 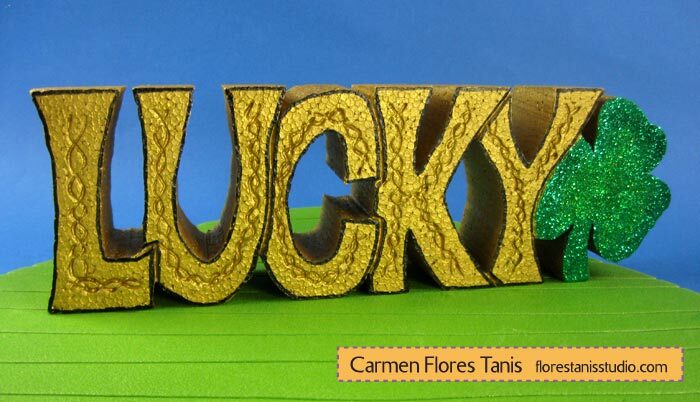 Have a great day and may the “Luck of the Irish” be with you! Many moons ago before I was married, I spent a wonderful month traveling throughout Ireland with my friend, Caitlin. We visited castles, cliffs and churches, saw Irish clog dancing, watched artisans blow glass and ate tons of potatoes. Once a sheep tried to jump into our rental car when we stopped to take a picture of the electric green landscape. And all the time we had the best of luck – from winning one hundred pounds playing bingo to hitting perfect traffic as we rushed to catch the last ferry of the day to Inishmore Island. So in honor of Saint Patrick’s Day, I carved this cheerful decoration from a sheet of Smoothfoam loaded with Irish motifs and a couple of puns. See if you can spot them! 1. 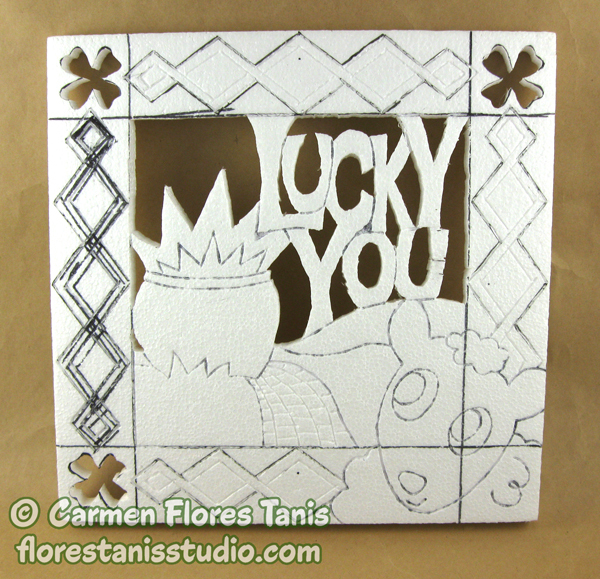 Draw the words “Lucky You” on a piece of paper to fit within the 12″ Smoothfoam sheet, allowing a 2″ border. Add a sheep and pot to the drawing. 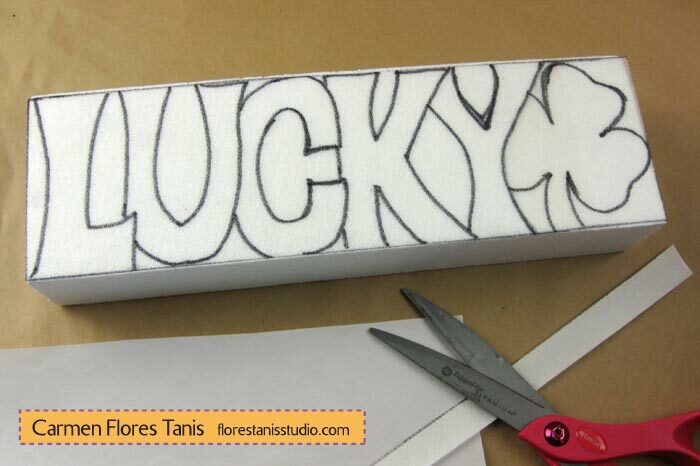 Put a sheet of Sulky Stick’n Carve on top of your drawing and trace the drawing with the permanent marker. Peel the backing release paper and apply the Sulky sheet to the center of the Smoothfoam sheet. Draw diamonds and shamrocks along the border. 3. Carefully carve out the design with the Mini-Scroll Table. You will need to unthread and insert the wire into each pilot hole to make each interior cut. 4. Use the Engraving Tool to add details and texture to the sheet. Peel off the transfer sheet when finished. 5. Paint the the carving black. Let dry before adding one more coat of paint. 6. Color in your carving with paint pens as shown. 7. 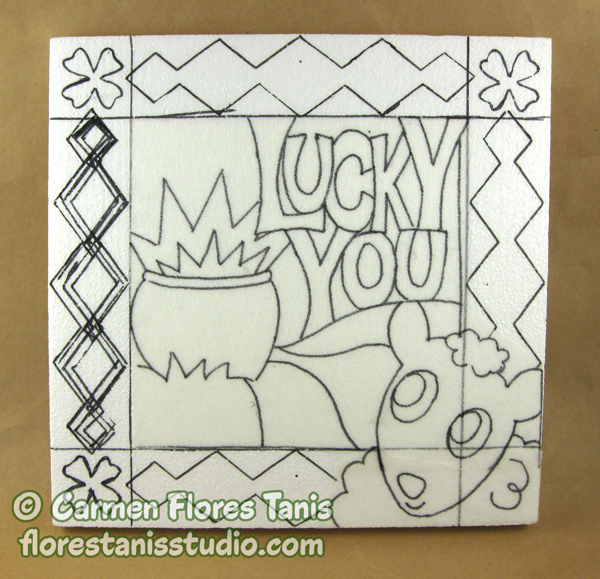 Color three green squares on the cork tile in the corners so the color peeks out from inside the carved shamrocks. 8. 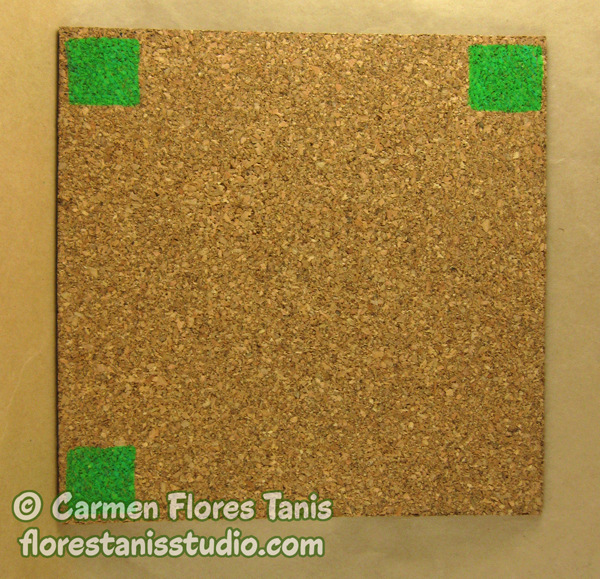 Glue the carving to the cork tile and glue a picture hanging hook to the back or display on an easel. Who says you can’t enjoy the clover a little longer? 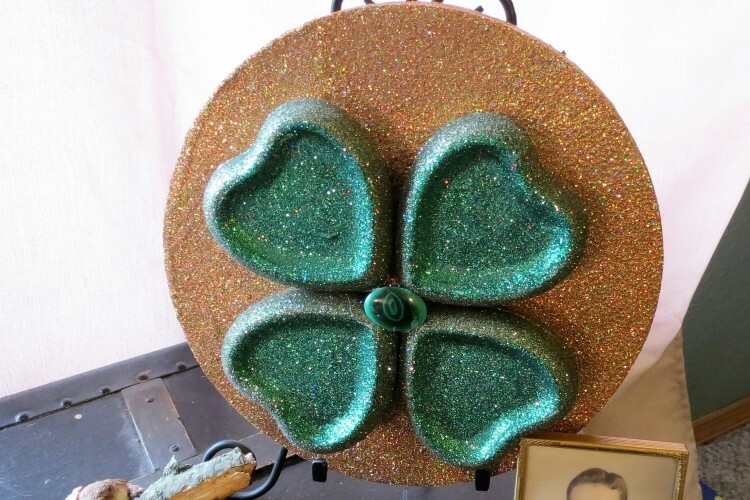 This decorative pot of shamrocks doubles as a photo holder, so you can display your St. Patrick’s Day party pictures or cute springtime photos of the family. 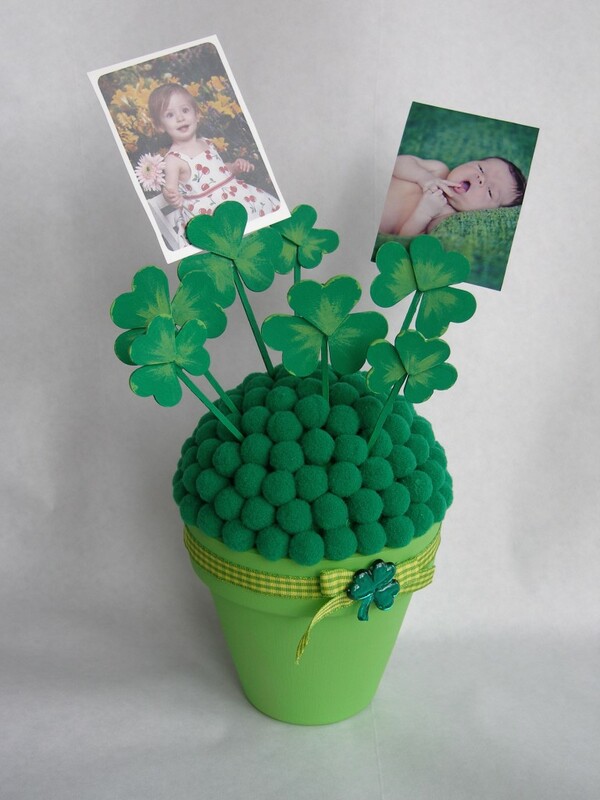 Learn how to create this flower pot picture holder below. 1. Paint the pot with Sour Apple and the Smoothfoam ball with Kelly Green; allow both to dry. 2. Glue the ball halfway into the pot and glue pom-poms over the top of the ball. 3. 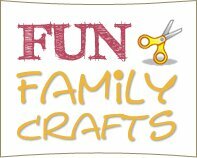 Glue two small hearts to either side of a craft pick about ¾” down from the top. Glue a third small heart over the first two. This will leave a slot between the craft pick and the top heart where you can slide in a photo or card. Allow to dry. 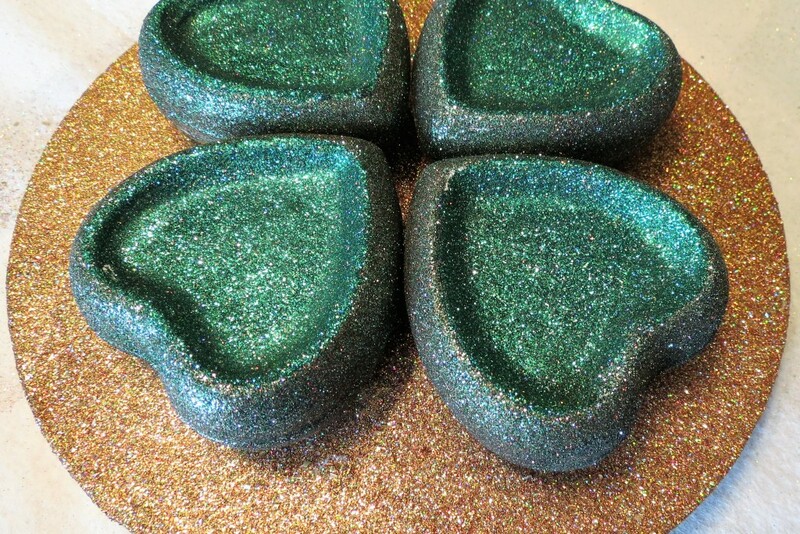 Repeat with the rest of the small and medium hearts to make a total of 3 small and 4 medium shamrocks. 4. Paint all the shamrocks Kelly Green; allow to dry. Dry brush the shamrock centers and some of the edges with Sour Apple. 5. Wrap the ribbon around the rim of the pot, glue into place, and trim off the excess. Make a bow with the remaining ribbon and glue it over the ends. 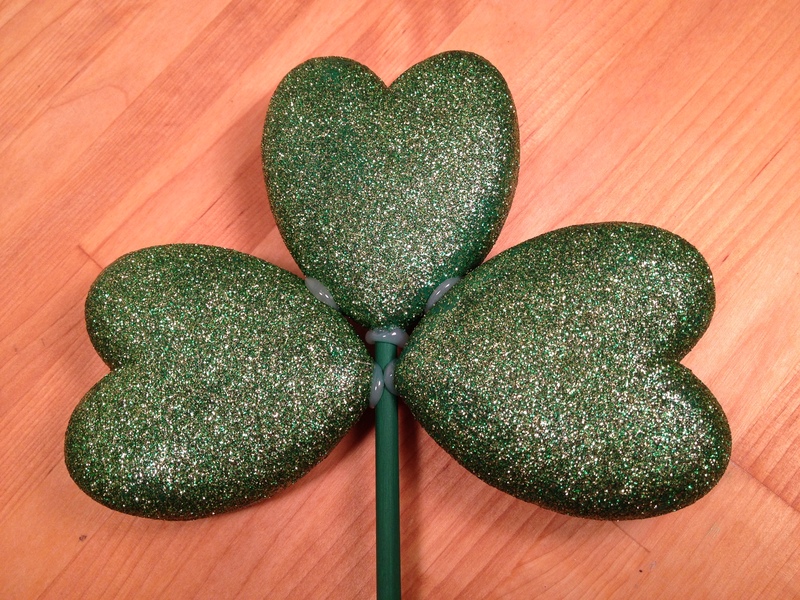 Glue the acrylic shamrock over the top of the bow. 6. 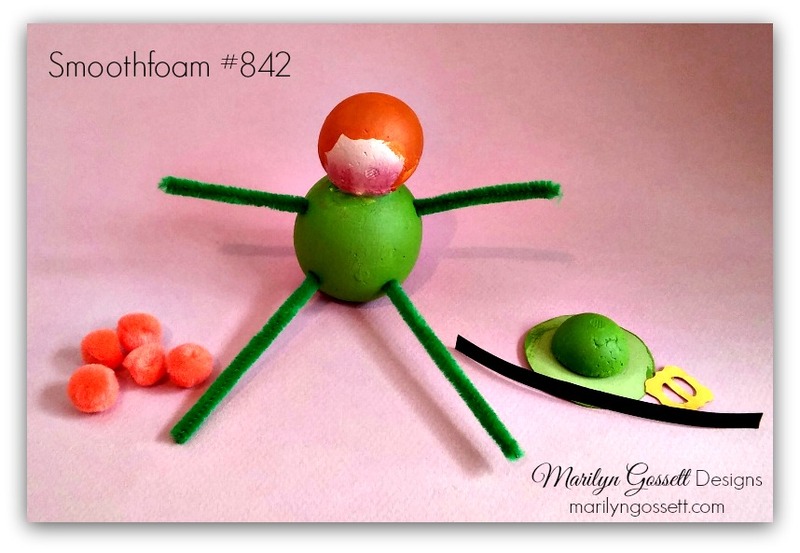 Poke the ends of each shamrock into the foam ball. Trim some of the craft picks shorter as desired for varied height in the arrangement.